Scott and Bev Thomson started with the purchase of a small paint manufacturing company in Rotorua called The Paint Factory in 1986. They had 3 retail outlets, and some may remember their View Road store. In 1989 they bought Damar Coatings. 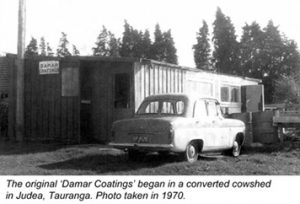 Damar Coatings was originally founded as a coatings company in 1968 by business partners Ken Darragh and Tony Martin who produced their own range of industrial-use paints and varnishes from a converted cowshed in Judea, Tauranga. 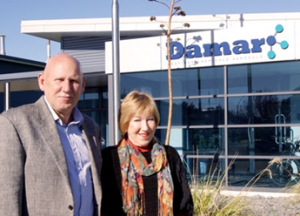 Scott and Bev then moved the manufacturing base from Tauranga to Rotorua, incorporated it into their existing company and started using the Damar name. (The name ‘Damar’ was derived from the surnames of the two original partners). From there, as the saying goes, the sky was the limit! Scott and Bev have seen the company grow from strength to strength. From humble beginnings as a small paint manufacturing company with only a few employees, to a medium-sized business with over 160 employees, offering a wide range of services and products. The acquisition of a number of companies/brands along the way and investment into state-of-the-art facilities has been instrumental in the continued growth of the business throughout the years. And thanks to our purpose-built manufacturing facility, we’ve been able to diversify our business to include aerosol manufacture as well as liquid, powder and putty filling. The future looks bright for Damar as Scott, Bev and the management team at Damar look to grow the business even further by capitalizing on the core competencies accrued over the last 30 years.